It’s been a good number of years since either one of us has had a classic Nabisco Fig Newton. You know the thing: a flattened roll, with a fig paste filling contained inside a “pastry” that’s somewhere between a cake and a cookie. Back in the day I could eat them by the sleeve. Whether at home or hiking on trails, they were a go-to snack. But that was a long time ago. Italian company Jovial makes a gluten-free fig-filled cookie, but with no disrespect, they’re just not the same. It was time for us to make a from-scratch gluten-free version at home. The result is remarkably tasty—a moist, figgy filling with a “pastry” roll that tastes strikingly reminiscent of the original Fig Newton. Of course, Fig Newton is Nabisco’s trademarked name for the food, so we wrestled with what to call this recipe. Fig cookie? Fig roll? Fig-filled cake? None of the generic terms we came up with seemed quite right. Then it hit us—you might say—like an apple falling on our head out of a tree. Sir Isaac Newton was a physicist who came up with the law of universal gravitation and a broader set of physics “rules” known as Newton’s laws of motion or classical mechanics. Later, along came this guy named Einstein, who introduced a new set of laws known as his theory of relativity. Not that we’re comparing ourselves to Einstein, but this recipe represents a new take on an earlier classic, created with a new set of gluten-free rules. Hence, Fig Einsteins! 1. First make the filling: combine all ingredients in a saucepan, bring to a simmer, and cook over medium heat until the liquid is absorbed and the mixture is thick, about 30 minutes. Stir occasionally. 2. With either an immersion blender or regular blend, puree the filling until fairly smooth. Set in the refrigerator to let cool. 3. Next make the dough: combine the flour, xanthan gum, sugar, salt, baking powder, baking soda, and cinnamon in a bowl and whisk to combine. 4. Cut the butter into chunks and work it into the flour mixture with a pastry cutter or your hands until the mixture resembles sand. 5. In a separate bowl, whisk together the eggs and vanilla. Add to the flour mixture and mix until the dough forms. 6. Roll the dough out between two pieces of plastic wrap to form a rectangle about 18″ x 10″. 7. Preheat the oven to 350 deg F. Line a baking sheet with parchment paper or a silicone mat. 9. 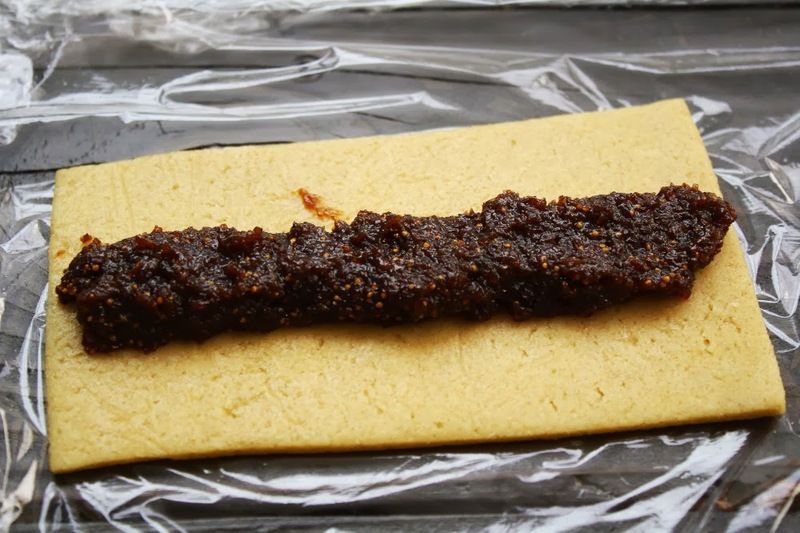 Keeping the dough on the bottom piece of plastic wrap, slide onto a cookie sheet and pop in the fridge until the fig mixture has cooled, about 10 minutes. 10. Remove the dough and fig filling from the fridge. Move one rectangle to the reserved piece of plastic wrap and spread 1 1/2 tbsp of filling down the lengthwise center of each rectangle. 11. Use the edges of the plastic wrap to lift the dough fold up the rectangle to make long tubes. Press to slightly flatten. 12. Place the tubes seam-side down on the prepared baking pan. Repeat with remaining rectangles. 13. Bake for 10–12 minutes, until slightly golden. 14. Remove from the oven, cut each roll into four pieces while still hot, and immediately place in a container with lid, ideally in a single layer. 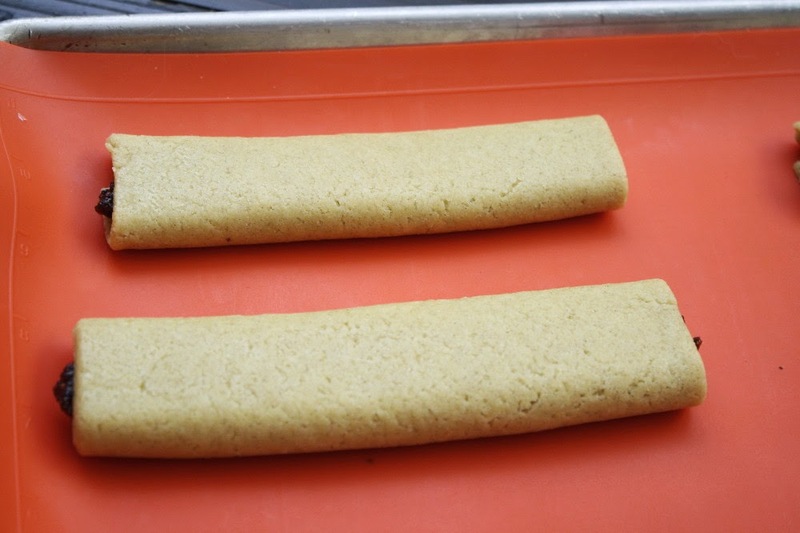 This allows the Fig Einsteins to steam while cooling, resulting in the soft, cake-like texture of the rolls. Step 14 is sheer genius! How do you guys figure this stuff out anyway? Fig Einstein’s is the perfect name. Now I have to finish your wonderful Tarragon Chicken so I can have some of these for dessert! Are those dried figs or fresh/frozen figs? I have both on hand. 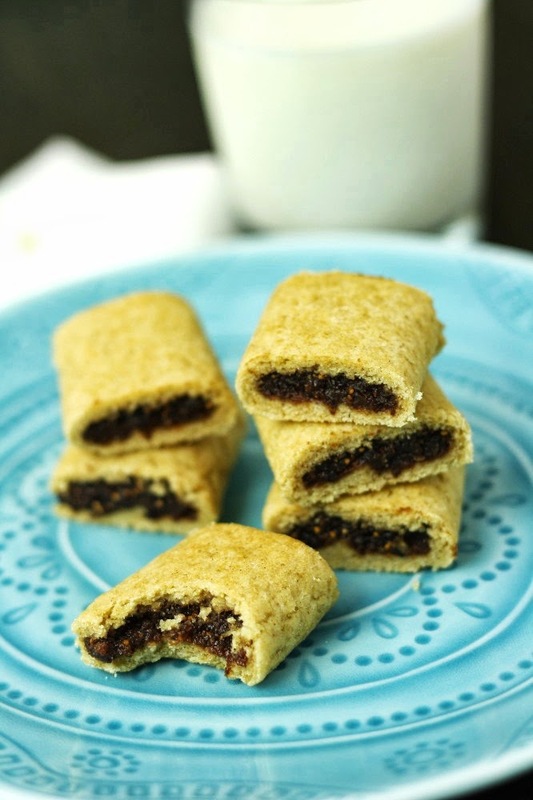 Grandmashadowcat – We cannot take too much credit for the steaming technique as we learned it from someone else, however, it is part of the trick to make these like traditional fig newtons! Anonymous – We used dried figs in this recipe, but either will work.